B.M.E in Music, from University of North Carolina at Greensboro. M.S. Curriculum & Instruction, from McDaniel. Music Teaching Certificate in Music K-12. Mr. Cherry is a trombonist who has performed with the Calvert Dance Band, Southern Maryland Jazz Ensemble, and the Ellicott City Trombone Ensemble. He also performs with DC’s Different Drummers Symphonic Band and Jazz Ensemble, DC Swing. 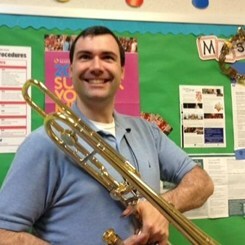 He has over 15 years teaching experience on trombone, 12 years in Anne Arundel County Public Schools. He currently teaches at Brooklyn Park Middle School as the Band teacher for the Performing and Visual Arts Magnet program and the liberal arts Band program. He has taught students across Anne Arundel County from grades 5 through 12. Mr. Cherry is available for trombone lessons, baritone/euphonium lessons and tuba lessons. His past students have earned alternate seats in MD Senior All State Band, Anne Arundel County All County Band and have performed and earned superior ratings at District and state Solo and Ensemble Festivals.